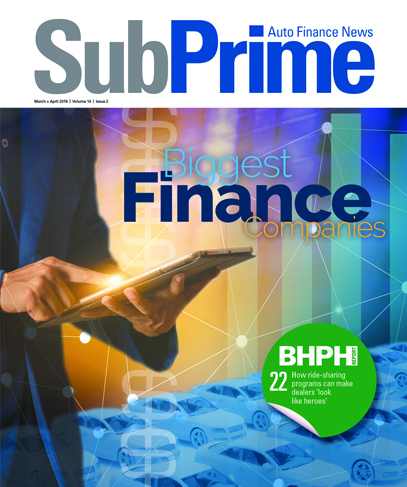 SpringboardAuto highlighted this week that the company has produced an upward trajectory of completed auto financing equal to a compound monthly growth rate of 20 percent. As a result, the company announced it has expanded operations to 22 states, now covering more than 70 percent of the U.S. population — a move driven by dealers’ desire to further improve customer satisfaction and consumers’ demand for a streamlined dealership experience. “The difference in our model is how we define our customer base,” SpringboardAuto chief executive officer Jim Landy said. “Our goal when building the technology was to create a secure, fast and flexible platform that mutually benefits dealers and customers. “Today’s car buyers are tech savvy and time constrained. In our model, we significantly reduce the administrative work so dealers and customers can enjoy the car selling and buying experience,” Landy continued. Driving this change is the need for speed. SpringboardAuto insisted consumers want to spend less time in the showroom, specifically when it comes to doing paperwork. According to recent studies, customer satisfaction decreases as time spent at the dealership increases. Of that time, 33 percent is taken up with finance and paperwork, creating an opportunity for dealers to increase customer loyalty by reducing the time a customer spends in the dealership. Dealers and customers are catching on and becoming fans of this simple and straightforward process as evidenced by SpringboardAuto’s increase in completed financing — a compound monthly growth rate of 20 percent in 2017. SpringboardAuto was developed by Landy and other industry veterans upon recognizing the opportunity to simplify and automate a complete auto retail experience. The proprietary technology can provide self-serve, real-time financing tools including a financing configurator that can let customers accurately and instantly reconfigure loan terms within personalized parameters, a secure portal to easily upload documents, and instant approvals complete with an e-check. The live e-check can be printed from any computer and is ready-to-deposit — giving both parties confidence in the transaction. Brandi Hicks, who recently completed a loan through SpringboardAuto has vowed to spread the good word about her SpringboardAuto experience. “It was the easiest car purchase I have ever experienced. I've been at dealerships for well over 8 hours before to get approved for a car loan and get the paperwork done. This place was amazing. The whole thing took less than an hour and I left with my new SUV. I will recommend them to everyone I know,” Hicks said. More details are available at www.springboardauto.com.